It's that time of year when I like to take a look back at what projects YOU favored from DIY beautify the past year. Every year I'm surprised at some of my posts that become the most popular out in cyberspace! This year is no exception! The top 5 projects range from seasonal projects to room makeovers. Here's a look back at my top 5 projects from 2017. 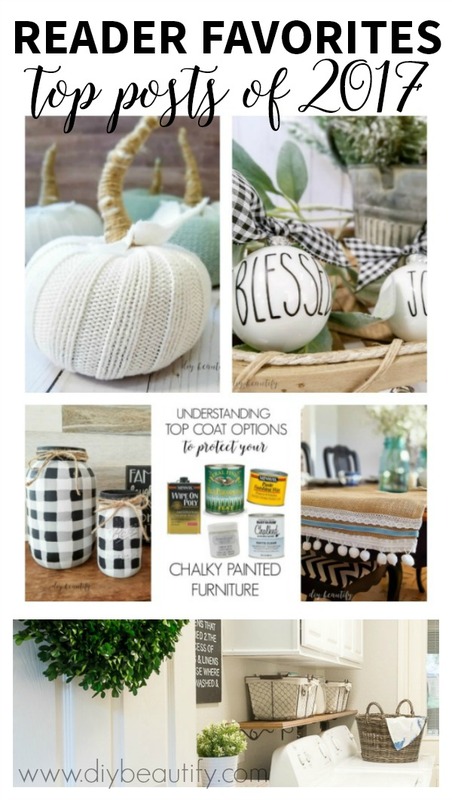 This post was a round-up where I shared some of the different options on the market to protect your freshly painted furniture pieces, as well as when to use each one. 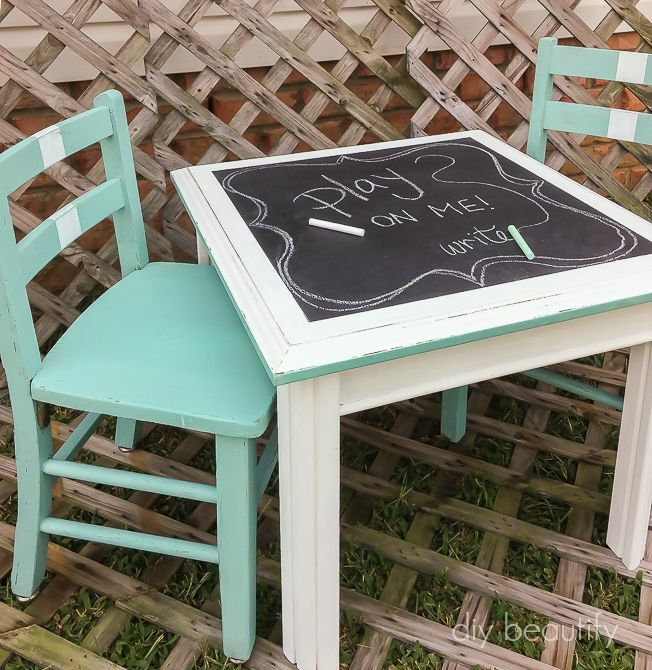 It's certainly not an exhaustive list, but it features products that I've used, love and recommend for both chalky painted furniture as well as stained pieces. I'm considering writing a post this year about what to do when things go wrong with your chalky painted piece! Please let me know in the comments if this type of post would interest you. 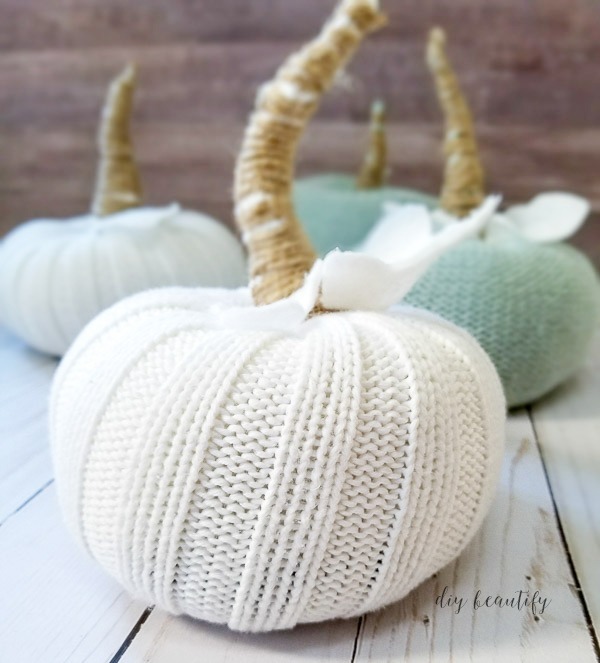 These little pumpkins are so easy and affordable to make, I was delighted to see that they made the list! I shared what type of sweater works best, and you can find the complete tutorial by clicking the link, including how to make those long, bendable stems! Why not stock up on sweaters now so you're ready to craft a pumpkin patch full of sweater pumpkins for next fall? If you haven't heard of Rae Dunn yet, well...just do a Google search and see what comes up! Those tall, skinny letters on white pottery have stolen the hearts of women everywhere! The elusive pottery with its (usually) single word sayings have become SO popular and SO hard to find. I created Rae Dunn inspired ornaments so that even if you haven't found a single piece, you could still bring the look of Rae Dunn into your home! Getting letters to line up perfectly on round ornaments can be very tricky, but I'm sharing all my tricks and tips! You can check it out here if you missed it. Burlap is not as popular in home decor as it was a couple years ago. However, I try not to follow the trends too closely...I love what I love and decorate with what I love! 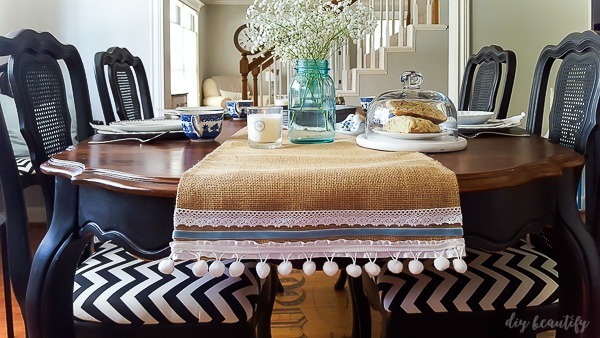 This simple burlap table runner is so easy to make, totally no-sew, and the ball fringe adds the perfect finishing touch! Whether you create a runner for your dining room table, or for a special occasion, you can alter the look with the trims that you choose and make it uniquely you! Mason jars painted with buffalo plaid are so charming, easy and fun to make! This is one of those projects where perfection is highly over-rated! The imperfection of the hand-painted lines just adds to the charm of these mason jars. 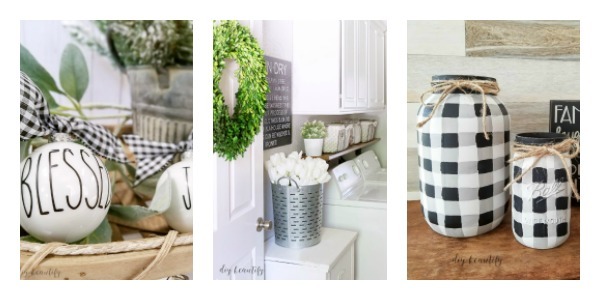 Buffalo plaid mason jars will add farmhouse charm to any room! Make a set for a table centerpiece, or a set of canisters...or just one or two to hold a candle, flowers, cotton stems...the possibilities are only limited by your imagination! I share tips and tricks to get the buffalo plaid look in my full, step-by-step tutorial. Those, my friends, are the TOP 5 Reader Favorite posts from 2017. But I had to include one more because it came in as a close 6th! 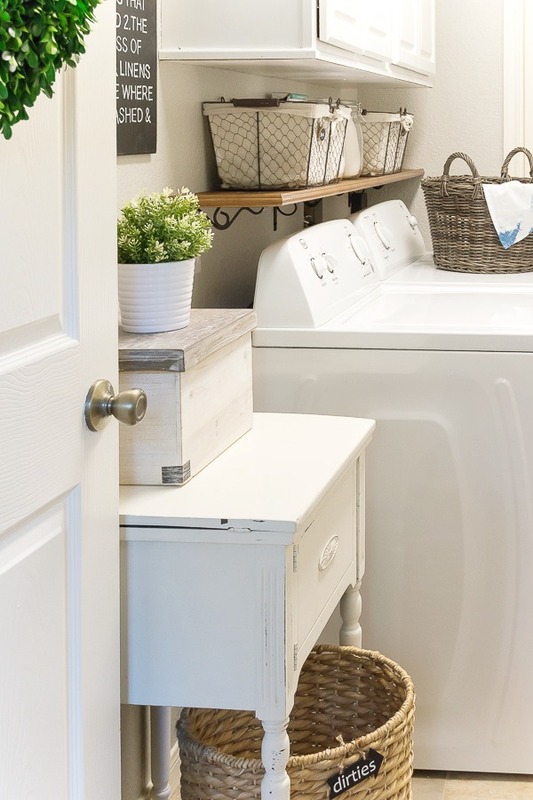 This laundry room makeover came in at under $77! Yes, really! Check the post to see the breakdown of my budget. The small size of our laundry room really did help me to keep my budget in check, but still get a fresh, modern farmhouse feel! All the projects that I completed are included in the post, I hope you check it out to get some ideas for your own home! I hope you enjoyed this look back at the top DIY projects of 2017! 2018 is shaping up to be a busy year already! I have 2 room makeovers planned, lots of painted furniture to share, and more decor inspiration that is budget-friendly and easy to accomplish! I would be honored if you chose to PIN THIS IMAGE below and share my blog with your friends who enjoy DIY projects, crafts and home decor! Having a loyal following is what enables me to continue to bring you FREE projects and tutorials! I wish you and your family a blessed New Year and hope that 2018 is the best year yet!